The meeting between the leaders of North and South Korea on Friday—the first in more than a decade—was as historic as it was intricately choreographed. Held at the border village of Panmunjom in the heavily fortified demilitarized zone dividing the two countries, the summit came on the heels of a year in which the North rapidly scaled up its nuclear program, escalating tensions with the South. At the meeting, the North’s Kim Jong Un and the South’s Moon Jae-in promised to rid their countries of nuclear weapons without specifying how they would do so and even vowed to resume temporary reunions between relatives separated by the nearly 70-yearslong conflict. Few expected that such a summit would occur anytime soon. But once it was announced, those in charge of planning it took the view that everything from the menu to the décor to the furniture dimensions would be painstakingly planned and steeped in symbolism. “There was a lot of branding that went into it to make it seem that these two countries really are together,” Jack Kim, a senior adviser at HanVoice, a non-profit for North Korean human rights and refugees, told CTV’s Your Morning. 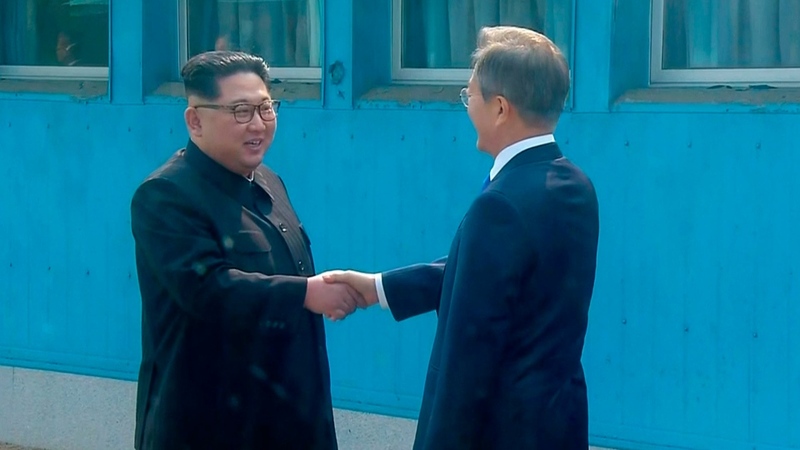 The meeting began with a handshake and the exchanging of pleasantries between Kim and Moon and continued with two small, but significant, footsteps. 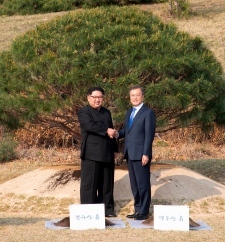 As Kim stepped over the concrete slab delineating the border between the two Koreas, he became the first leader of the North to step into the South. Here are the other symbolic gestures from the summit that you may have missed. The summit’s meetings took place at the Peace House, a three-storey building that was frantically renovated specifically for the event. Its makeover included the construction of a new oval table, curved like a bridge to represent the two countries coming together. The table’s diameter of 2,018 millimetres is a nod to the year of the meeting. The design of the chairs, too, was deliberate. Each was decorated with a carving of a unified Korean peninsula. Even the Dokdo islets, offshore rocks that are at the heart of a territorial dispute with Japan, are included in the carving. A painting of the North’s Mount Kumgang, which many from the South hope to one day visit, hung on the wall. Kim and Moon also planted a pine tree, dating back to 1953 when an armistice agreement between the two countries was signed to end hostilities, to commemorate the historic meeting. The tree was planted and watered using a mixture soil and water from both the North and the South. The charm offensive continued with culinary diplomacy. 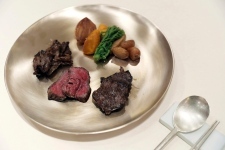 The food served at a banquet included a Swiss potato rosti dish that Kim is alleged to have enjoyed during his childhood years as a student in Switzerland. Dumplings and fish dishes that were favourites of former South Korean leaders were served, in addition to a signature cold noodles dish from the North Korean capital of Pyongyang. Those in attendance at the banquet washed it all down with a liqueur popular in the North. 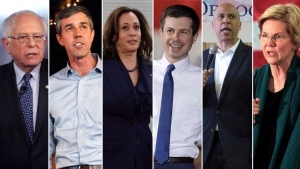 Experts caution that the symbolic gestures scripted to the finest detail may not necessarily bring change unless more substantive policy discussions are had. “There is a lot of work to be done to transform the most heavily militarized area in the world into a zone of peace,” Scott Snyder, a senior fellow for Korea studies at the Council on Foreign Relations, told CTV News Channel.